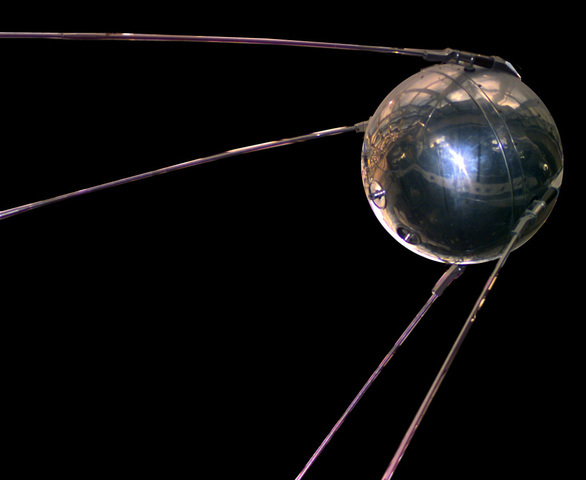 http://science.nationalgeographic.com/science/space/space-exploration-timeline/The Soviet Union ushers in a new era—the space age—with the launch of Sputnik 1. A technological feat, the beach ball-size satellite weighs 184 pounds (84 kilograms) and takes 98 minutes to orbit Earth. The launch grabs the world's attention—and catches the U.S. off-guard. 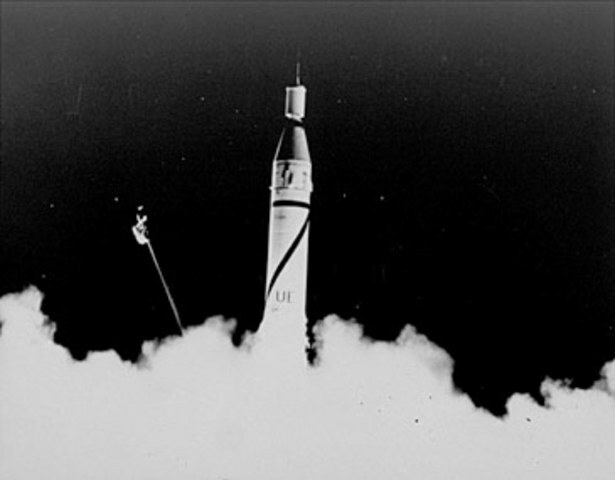 The first successful American satellite doesn't get off the ground until January 31, 1958. 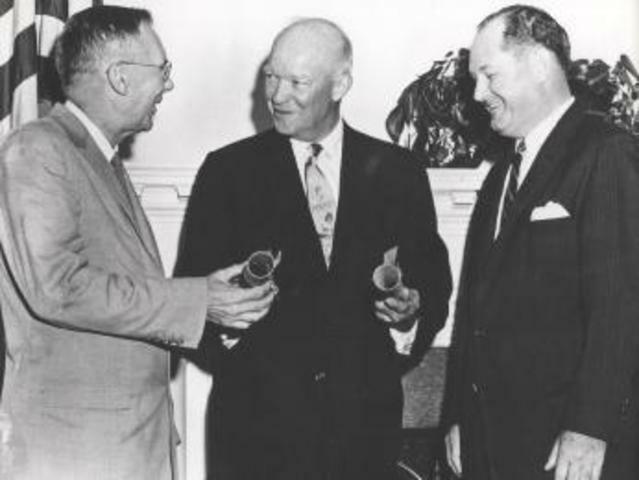 Fearful that Soviet successes in space mean the U.S. is losing the Cold War, congressional leaders, including future President Lyndon B. Johnson, quickly write the National Aeronautics and Space Act. The act creates a civilian agency, the National Aeronautics and Space Administration (NASA) to assume many of the duties. 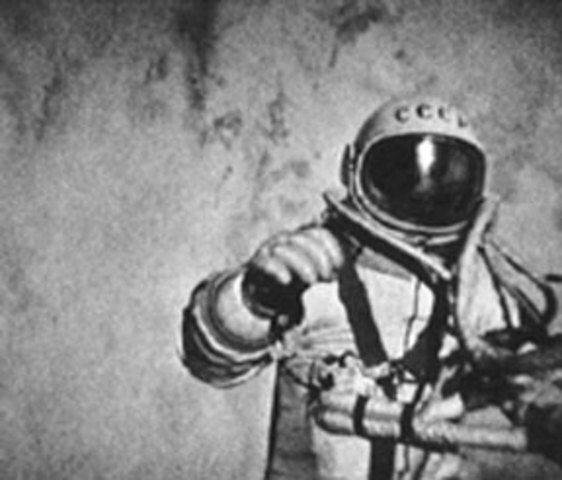 After several unsuccessful (and apparently fatal) attempts at manned flight, the Soviet Union launches cosmonaut Yuri A. Gagarin on a 108-minute flight. 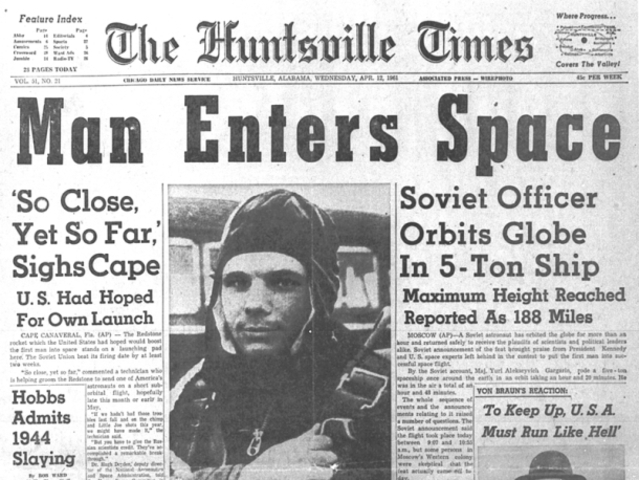 Gagarin becomes the first to successfully orbit the globe, circling once at a peak altitude of about 200 miles (320 kilometers) above Earth. His spaceship, however. 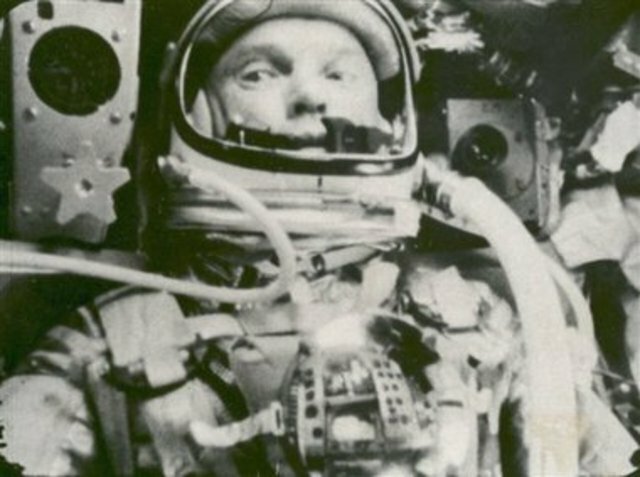 In a mission that at one point looks like it might end in disaster, astronaut John H. Glenn orbits the Earth three times in a nearly five-hour flight. On the descent there appears to be a problem with his Mercury capsule's heat shield, raising the specter that the spacecraft might burn up. But the shield remains in place, and Glenn successfully splashes into the Atlantic. He carries a small National Geographic Society flag with him on the mission. 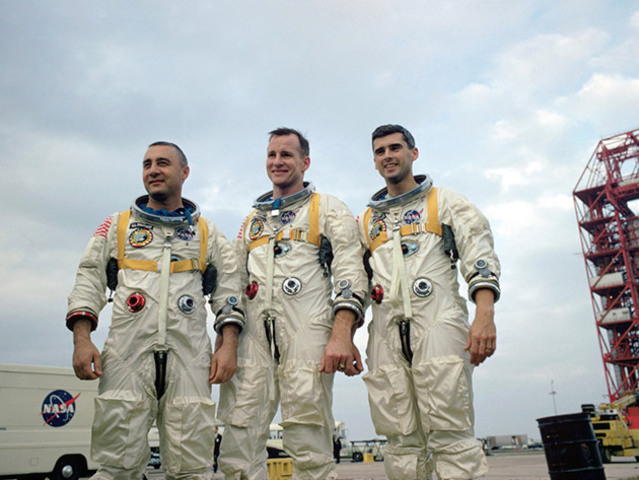 n a six-day flight culminating with a televised Christmas Eve reading from the Book of Genesis, Apollo 8 astronauts Frank Borman, James Lovell, Jr., and William Anders become the first to leave the gravitational influence of the Earth. In ten orbits of the moon they give an enormous boost to the nascent environmental movement by snapping stunning photos of the Earth—a blue-and-white marble rising above the stark lunar surface. 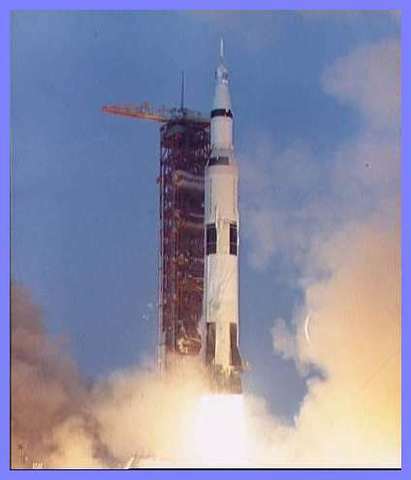 The launch is the first manned test of the Saturn V rocket. 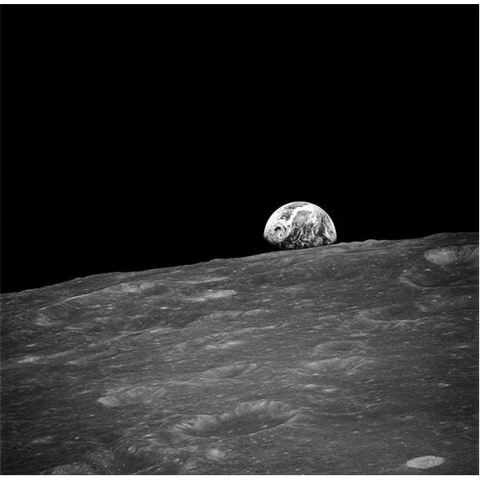 In a six-day flight culminating with a televised Christmas Eve reading from the Book of Genesis, Apollo 8 astronauts Frank Borman, James Lovell, Jr., and William Anders become the first to leave the gravitational influence of the Earth. In ten orbits of the moon they give an enormous boost to the nascent environmental movement by snapping stunning photos of the Earth—a blue-and-white marble rising above the stark lunar surface. 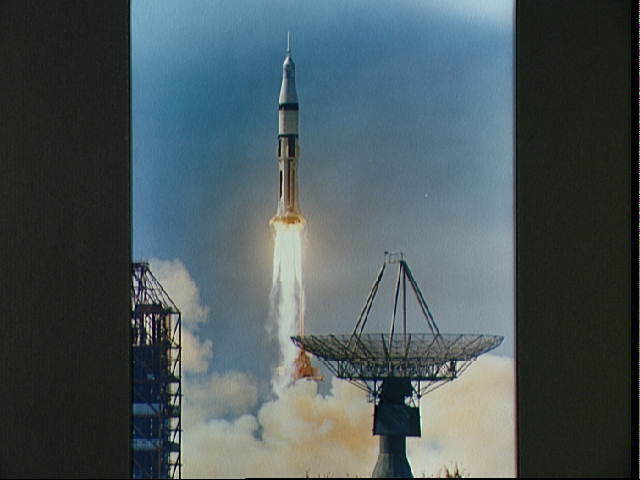 The launch is the first manned test of the Saturn V rocket. 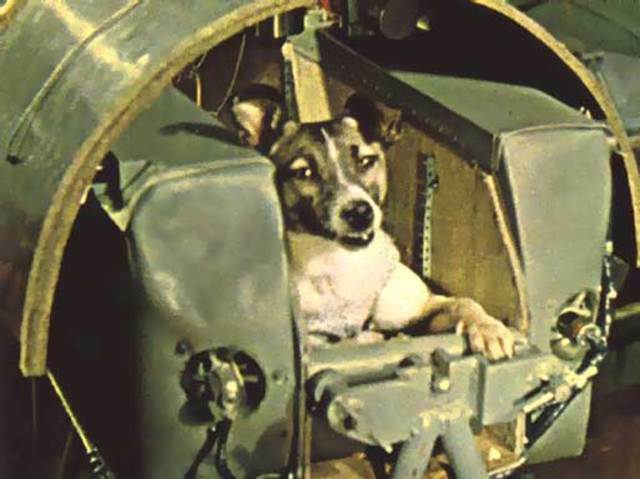 After an earlier attempt that failed due to a jammed hatch, three cosmonauts from the Soviet Union's Soyuz 11 mission successfully board the Salyut 1 space station. Their 24-day mission conducts scientific experiments and sets a new endurance record for space travel. Tragically, a failed valve causes the Soyuz craft to vent air on the return home, and on June 29, all three cosmonauts die. No more missions are sent to the Salyut station. 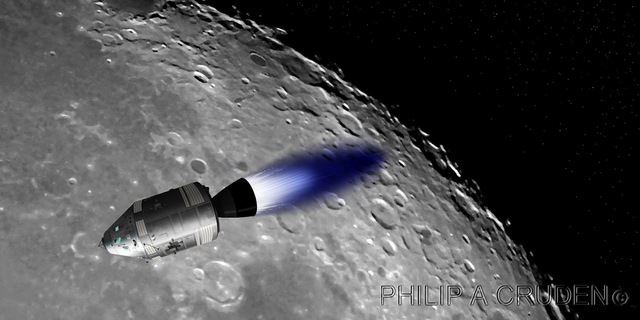 Apollo 15 carries an electric cart, like a stripped-down, foldable golf cart, to the moon. The rover, capable of carrying two astronauts plus supplies, greatly extends their exploration range. Astronauts David Scott and James Irwin are the first drivers, putting 17 miles (27 kilometers) on the moon buggy. 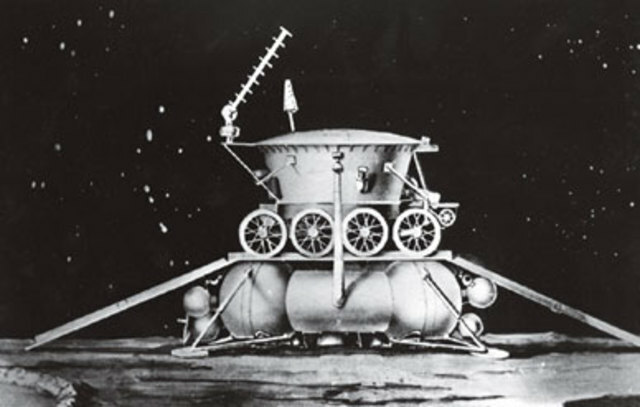 Because of the risk of being stranded without air, the astronauts are not permitted to drive father than the "walk-back" distance from their lunar module. 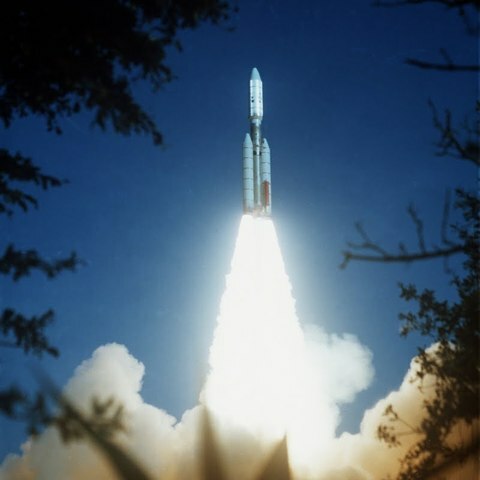 Skylab is launched on what will prove to be a six-year mission. 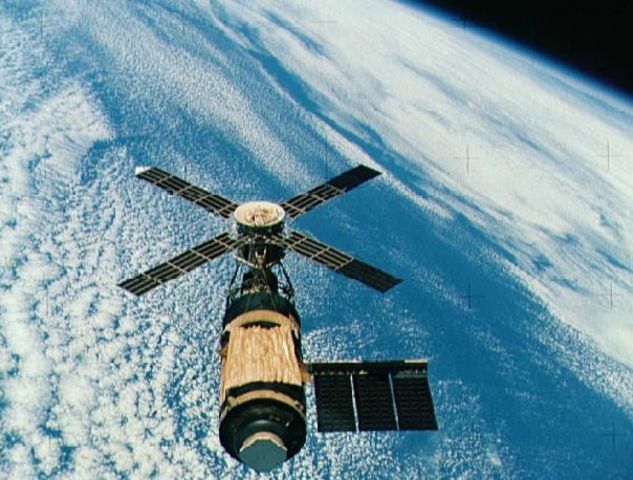 Three crews totaling nine astronauts occupy the station in 1973 and 1974, conducting astronomical experiments and making spacewalks to repair a damaged solar panel and rig a sunshade to keep the station from overheating. Skylab plunges to Earth on July 11, 1979, generating fear in people of being struck by falling debris. Nobody is hit, but one Australian town fines the U.S. $400 for littering. 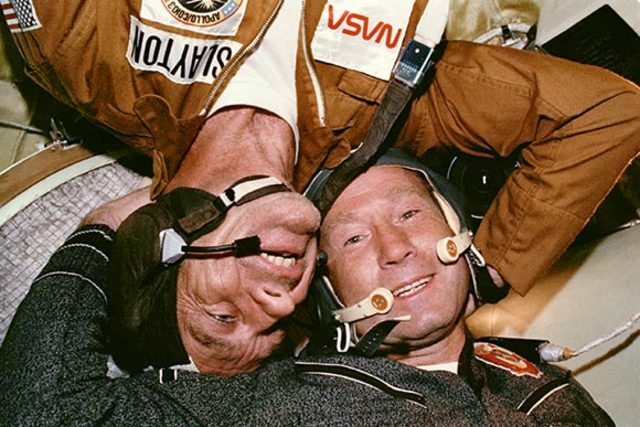 U.S. and Russian astronauts practice détente in space. In a mission called the Apollo-Soyuz Test Project (or Soyuz-Apollo Test Project, depending on point of view), crews from Apollo 18 and Soyuz 19 meet in Earth orbit, shake hands on live TV, and spend two days together. 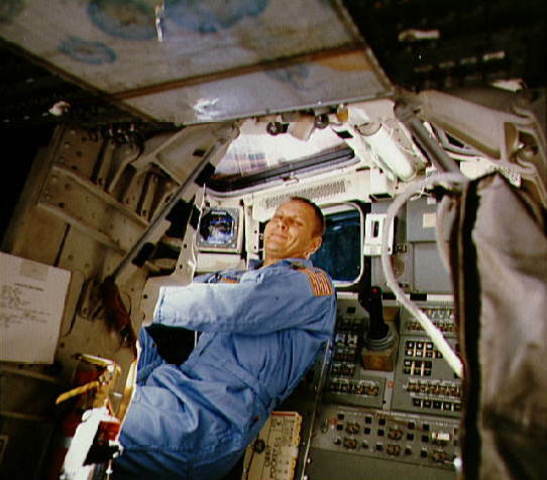 On the return, failure to throw a switch causes the American capsule to fill with lung-searing thruster-propellant fumes, but the astronauts suffer no permanent harm. 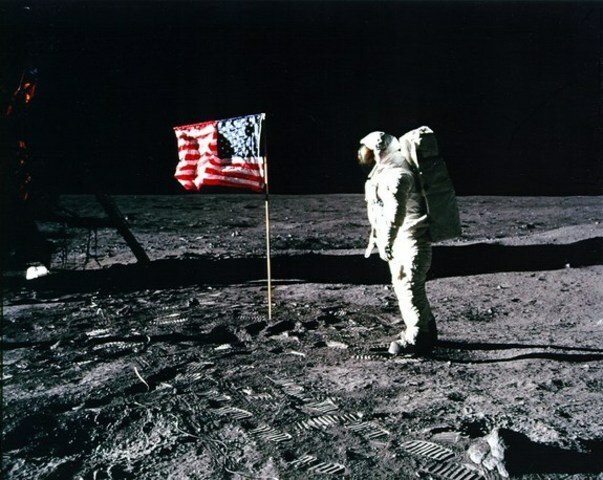 It is the last U.S. manned mission for six years. Viking 1 soft-lands on Mars. Pictures show a stark, rocky landscape much like some Earthly deserts, and chemical tests designed to search for life show anomalies in the soil that have yet to be fully explained. The lander remains operational until late 1982, when transmissions and communications end. Meanwhile, the Viking 1 orbiter operates for two years, snapping photos of the surface, including the famous "Face on Mars," an odd-shaped hill that provides fodder for many tabloid headlines. 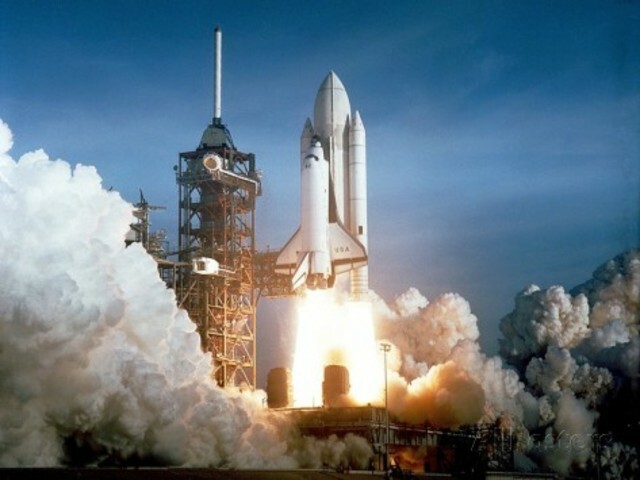 NASA debuts its manned cosmic commuter, the space shuttle, with the first-ever launch of Columbia. Commander John Young and pilot Robert Crippen spend two days in orbit around the Earth on the test flight and touch down, airplane-style, at Edwards Air Force Base in California. 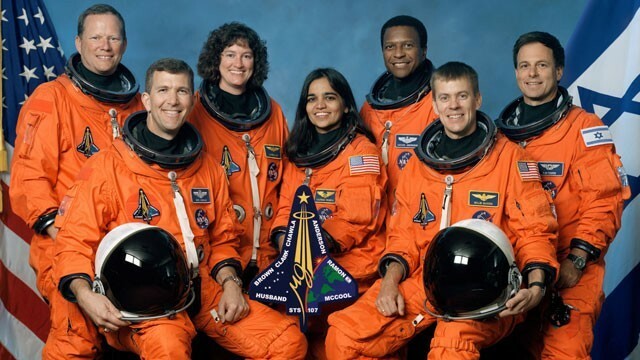 After four test flights in 1981 and 1982, the first space shuttle, Columbia, carries a crew of four—the largest crew ever to be launched into space on a single vehicle—on its first true mission. 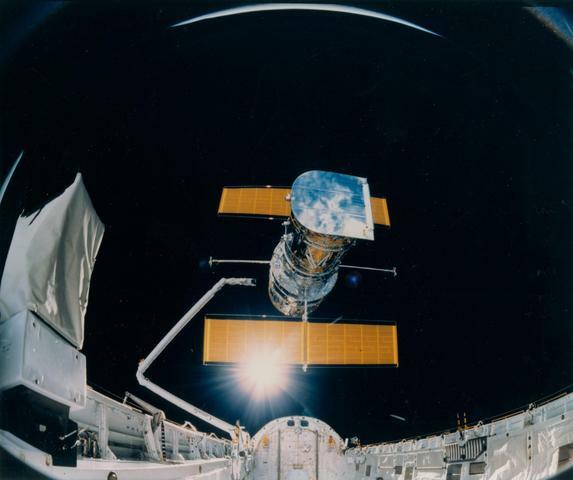 In its five-day mission, the shuttle deploys two commercial satellites, another first. In the first test of NASA's new Manned Maneuvering Unit, a sort of rocket backpack designed to fit over the astronauts' normal spacesuits, astronaut Bruce McCandless exits the space shuttle Challenger without a safety line. 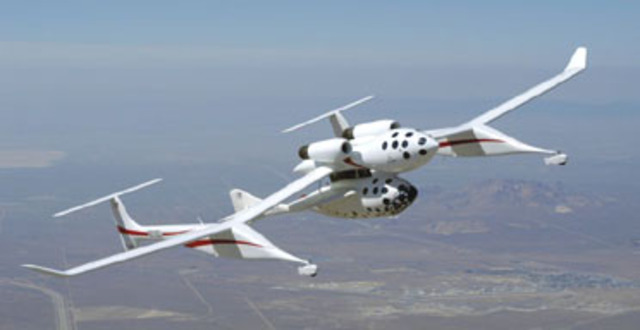 In the course of putting the unit through its paces, he flies 320 feet (100 meters) away from the shuttle and returns safely. 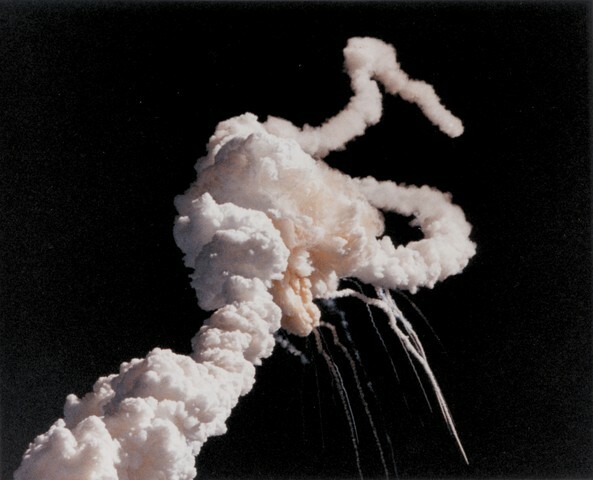 In a disaster seen live on television, the space shuttle Challenger disintegrates 73 seconds after liftoff. 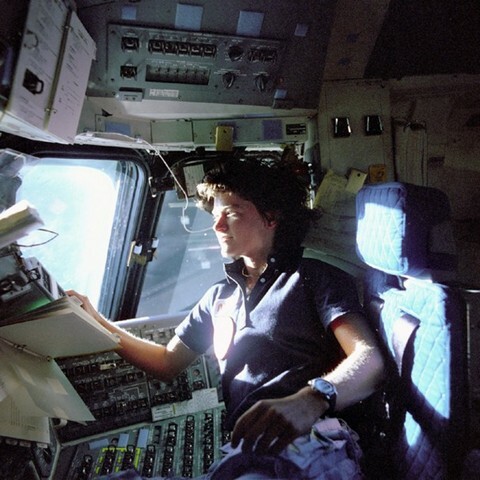 All seven astronauts are killed, including schoolteacher Christa McAuliffe. The fault is traced to a defective O-ring (a type of gasket) in a rocket booster. Cold weather and high wind shear also play a role. Contrary to popular impression, the shuttle does not blow up. Rather, it is ripped apart by aerodynamic forces. The astronauts probably survive until their cabin crashes into the sea. Thirty-six years after becoming the first American to orbit the Earth, former astronaut John Glenn boards the space shuttle Discovery for a triumphant return. 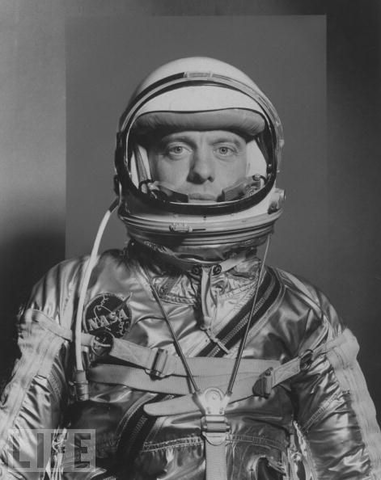 Soon to retire from 24 years as a U.S. senator, Glenn, 77, is the oldest person ever to go into space. He passes the physicals with flying colors. Medical tests during and after his nine-day mission will test the effects of spaceflight on the elderly and offer potential clues to scientists studying the aging process. Returning from its 28th mission, America's oldest space shuttle breaks up on reentry high over Texas. The cause proves to be damage to the heat shielding, incurred when a block of foam broke off the external fuel tank during lunch and hit the shuttle's left wing. 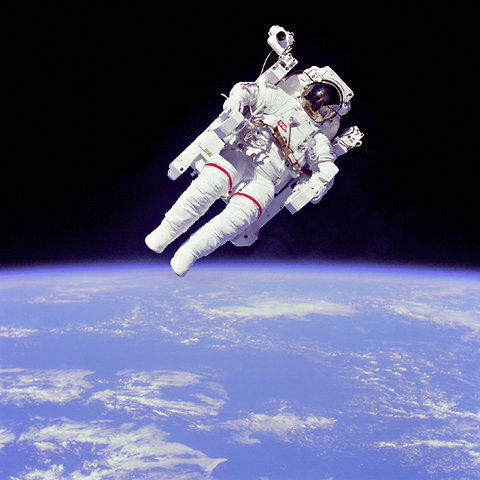 There is no way the astronauts can escape their vehicle, which is moving about 12,500 miles (20,000 kilometers) an hour. All seven die. 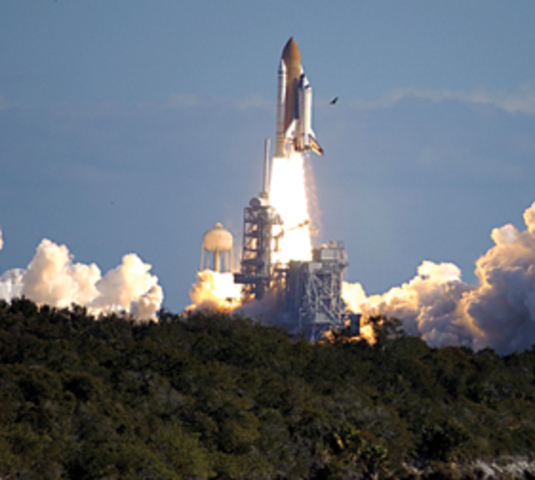 Shuttle missions are cancelled until 2005. 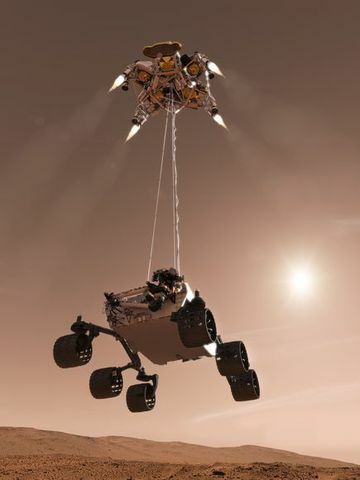 NASA's most complex robotic rover yet, christened Spirit, parachutes to the surface and bounces to an air-bag-cushioned halt in Gusev Crater. It is designed to last three months. Three years later, it continues to explore, aided by dust devils that scour sunlight-blocking dust from its solar panels. Early in the mission it makes a multimile beeline for the Columbia Hills, named in honor of the Columbia astronauts. As of mid-2007, Spirit has traveled nearly 4.5 miles (7.2 kilometers). Three weeks after Spirit's successful landing, its twin, Opportunity, lands on the opposite side of the red planet. Setting out to explore a region called Meridiani Planum, it immediately finds signs that the area once had water. In the next four years it travels 7.1 miles (11.4 kilometers), investigating several craters and vastly outliving its design life. 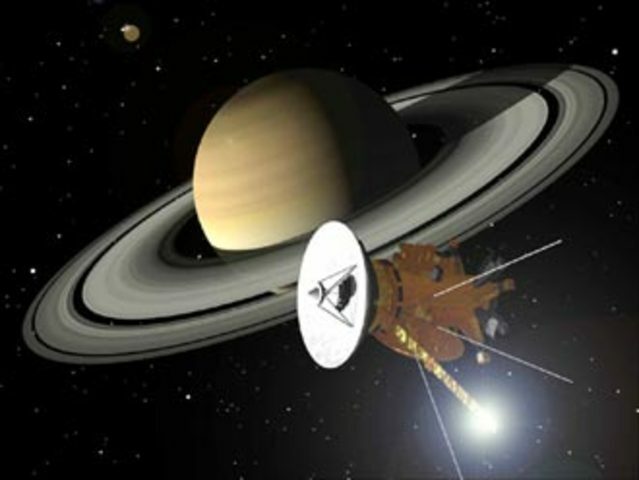 After seven years in transit, including slingshot flybys of Venus, Earth, and Jupiter, the first probe to circle Saturn reaches its destination and breaks into orbit. The mission seeks multiple targets for the price of one: not only Saturn itself but also its rings and large family of moons. By tweaking the orbit, NASA engineers plan several years of close flybys of several moons, including extensive mapping of the giant moon Titan. 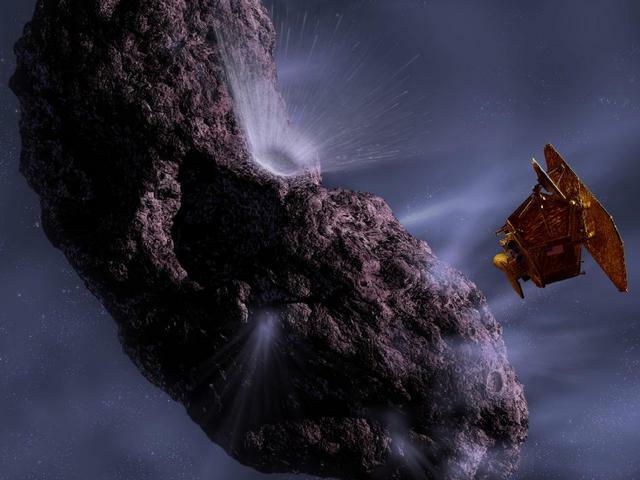 A two-part probe called Deep Impact meets Comet Tempel 1. One piece of the probe, weighing 816 pounds (370 kilograms) smacks into the comet at a speed of 6.3 miles (10.3 kilometers) per second. The other "flyby" part passes by, observing the dust and gas released by the impact and peering at the subsurface layers of the comet, revealed in the impact crater. NASA considers diverting the surviving, flyby module to another comet, for future research.